Navigate: StoreFront / Bake Shop / Decorations / Confetti - Bright Dinosaurs - 2.4 oz. 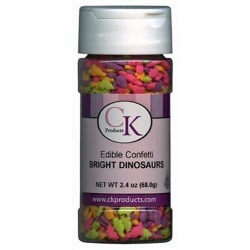 Confetti - Bright Dinosaurs - 2.4 oz. Ingredients: Sugar, Rice Flour, Partially Hydrogenated Vegetable Oil (Cottonseed and/or Soybean), Corn Starch, Gum Arabic, Cellulose Gum, Confectioner's Glaze, Carrageenan, Soy Lecithin, Yellow 5, Artificial Flavor, Blue 1, Red 3 and Red 40. This product is prepared and packaged using machines that may come into contact with Wheat/Gluten, Eggs, Dairy Products, Peanuts, Soy, Tree Nuts.